1. Use solar power to get electricity,with 4 sensors. 2. 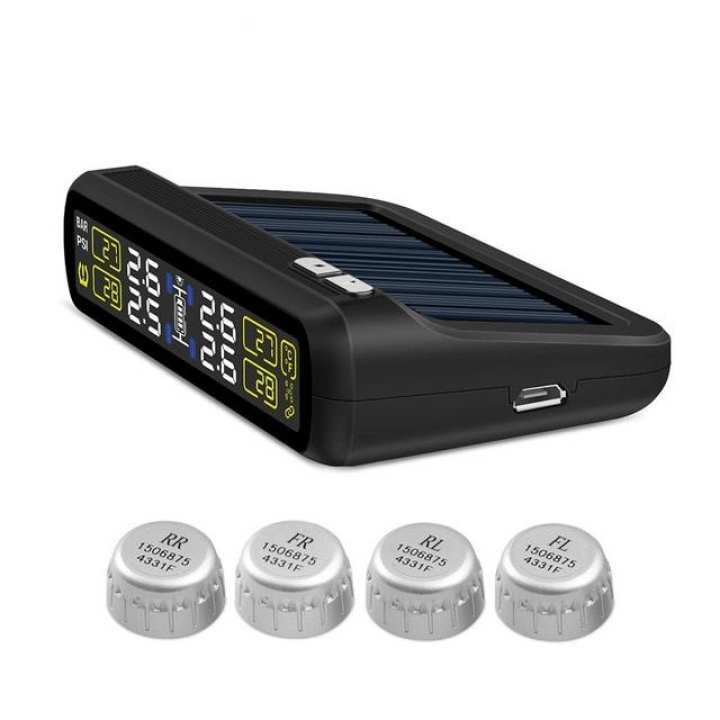 With the bigger solar pannel,easy to get solar powr and have a extra USB for charging. 3. Light weight design for the sensor,no need to adjust to balance when the tire moving. 4. Monitoring the tempreature and pressure with high degree accuracy, display for 4 tires at the same time. 5. Save gas,forsee air leakage,reduce tire wearout,balance tire pressure,ensure safety driving. 6. RF wireless technology,can auto-alarm,when tire pressure and temperature is abnormal. 7. With two pressure unit"PSI,BAR " and two temperature unit"℃,℉" for option. 8. Support tire position exchange function. 9. Sensor protection grade: IP5K4K.